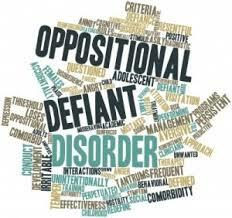 What Causes Oppositional Defiant Disorder In Kids? Children who have a persistent pattern of explosive anger, irritability, arguing, defiance or vindictiveness towards their parents or other authority figures may have Oppositional Defiant Disorder (ODD). Signs of Oppositional Defiant Disorder generally begin during preschool, but can sometimes begin later in the child’s development. Without appropriate treatment, symptoms of ODD can worsen and lead to serious problems for children with ODD for their functioning at home, school, and with peers. It is not always easy to tell the difference between ODD and more common defiance that we see in all children. Although the list below can help you determine if your child may have ODD, it is always important to have your child evaluated by a mental health professional who can help determine if your child’s difficulties are best explained by ODD or another disorder. Angry and Irritable Mood: Children with ODD may often lose their temper, seem touchy or easily annoyed by others, and appear angry and resentful. Argumentative and Defiant Behavior: Children with ODD may often argue with adults or other’s in authority, actively defy rules, deliberately annoy people, or blame others for their mistakes or misbehavior. Vindictiveness: Children with ODD may show a pattern of spiteful and vindictive behavior. ODD is thought to be caused by biological and environmental factors. ODD tends to run in families, so it is very common for a child with ODD to have another family member who also has ODD or another psychological condition, such as Attention Deficit Hyperactivity Disorder (ADHD), substance use disorders, or bipolar disorder. Children with ODD also have differences in the part of the brain that controls judgement, impulse control, and reasoning. This means that if something frustrating happens, children with ODD are less able to come up with a good solution to solve the problem and more likely to respond quickly without thinking. The part of the brain that helps to process social information is also different in children with ODD. When a child with ODD has a neutral interaction with a peer or an adult, they are more likely to interpret the other person’s facial expressions or actions in an aggressive way, so they often feel attacked by others and instinctively respond with aggression. Lack of structure and parental supervision is also associated with the development of ODD. Children also learn from models in their life—kids who grow up in aggressive households, are physically abused, or exposed to community violence are at risk of developing ODD. How Can a Psychologist Help with ODD? ODD usually improves over time; however, children with ODD may go on to develop psychological problems as adults. It is important to get treatment early. Parents can learn how to best respond to oppositional behavior and how to interact with their child in a way that will help the child learn how to follow directions. The child can learn to cope with frustration and anger in a more appropriate way and improve their communication skills.